Fed up with trying to memorise detailed instructions on how to work your iPad? With the guidance of this book you can figure out what to do – for yourself. The book begins with a one-page “recipe to do anything you want with an iPad”. To use this simple recipe you need to think clearly about what it is that you want to do and then be able to recognise the things you need to touch on the touchscreen. The best way to pick up this generally applicable knowledge is by exploring. This is much more fun than trying to rote learn a set of instructions. Explore your iPad – for seniors will guide you on this journey of exploration. The Chapter titles are: Enjoying keeping active; Playing games; Helping someone who has problems with everyday living; Keeping in touch with friends and family; Joining an online community, and Getting creative, photos and art. Apps featured include: Angry Birds, Candy Crush, Words, Fitbit, My Fitness Pal, Accessibility Settings, Mail, Messages, Facetime, Skype, Facebook, LinkedIn, Blogger, Twitter, Photos, Flikr, Dropbox. an Appendix – Getting apps and connecting to the internet. The book covers all kinds of iPads including the iPad Air and the iPad mini, iOS 9 and iOS 10. This chapter is about gadgets that make life easier for people who have problems with aspects of everyday living. It is written for people who have ageing parents or friends and relatives who could be helped in this way. 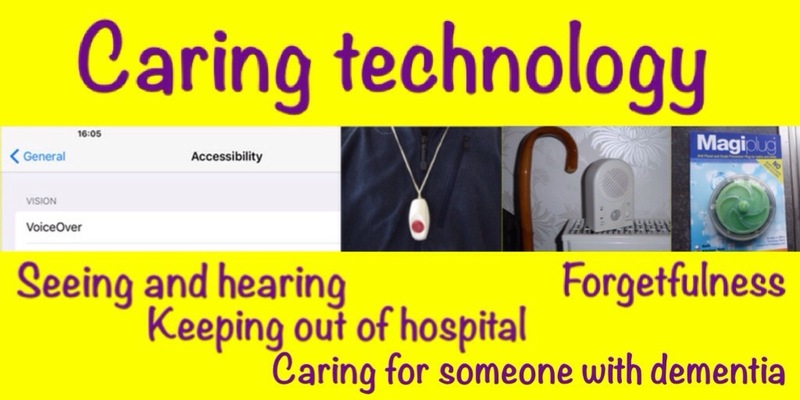 This free PDF may also be useful to for professional carers who would like an introduction to accessibility, telecare and assistive technology that they can give to clients and their relatives. The chapter is very close to my heart as it is based on my most recent research. For this reason I included it in my book “Explore your iPad – for seniors”, even though it is mainly about technologies that are not iPad oriented! Aside – Is activity monitoring “watching over you” or “spying”? Glossary of iPad and iPhone touchscreen buttons from “Explore your iPad – for seniors”. Download as free PDF. This Glossary starts with brief explanations of the various things you may tap/touch while using an app on an iPhone or iPad. I think of these as “touchscreen buttons”. There are also sections on what you can do with: physical buttons, gestures, the touchscreen keyboard, a stylus and speech. The Glossary comes from my book “Explore your iPad – for seniors” This is a guide for people who want to explore their iPad for themselves rather than follow detailed instructions. 1 tablet such as an iPad, Fire or Galaxy Tab. This recipe also works well with smartphones such as the Lenovo or the iPhone. Ask yourself what are you trying to do? How would the people who design apps describe it? What words would they use? Look for words and touchscreen buttons that could possibly get you nearer to achieving what you want to do. If you can’t see anything you may need to go back to the home screen and open a new app. Touch a word or touchscreen button. Ask yourself what again. How has what you just did added to your understanding of what you need to do? If you seem to be making progress, what do you need to do next? If you have clearly touched the wrong thing, how do you get back? Look again for words and touchscreen buttons that could possibly get you nearer to achieving what you want to do. … and so on until you have done what you set out to do. By applying this simple recipe you can learn to explore your phone or tablet without the need to memorise long detailed instructions. This book is no longer available as Kindle eBook. These chapters, with three more new chapters, are now available as a free iBook “Explore your iPad – for seniors”. Please see page Get “Explore your iPad – for seniors”. Fed up with trying to memorise detailed instructions on how to work your iPad? Would you rather have a guide that empowers you to discover new things to do – for yourself? The Explorers’ Guides are a new kind of technology book. Written to be entertaining and informative, each guide is structured around basic human needs. to help someone who has problems with everyday living (Chapter 3). Part 2, to be published later in 2016 will include chapters on: watching TV on your iPad, keeping in touch with friends and family, and creating photos and art on the iPad. sign-posted explanations of useful jargon but no unnecessary jargon. Apps featured include: Fitbit, My Fitness Pal, Angry Birds, Candy Crush, Accessibility Settings. What would you like your relatives to do with your Facebook page when you die? Do you have online banking accounts that the beneficiaries of your will may not find out about? No one likes to think about dying. At the same time we all know the value of having a will, in order to ensure that our legacy goes to the right people with the minimum fuss and legal costs. Physical assets are easy. You can bequeath objects of financial or sentimental value to your relatives and the executors of your will can easily find those objects in your home. There are probably also physical traces of your bank accounts, printed statements and so on, that provide the account numbers needed to access the money. Online digital assets are more difficult. Research for Co-operative Funeralcare found that three out of four people surveyed had not made any arrangements for online banking details to be passed on. Almost 80% of those who attempted to manage online bank, utility, shopping and social media accounts following a death said they had experienced problems. However, it is not all about money. Facebook now has legacy settings that allow a designated “legacy contact” to “memorialize” your account or simply close it if that is your wish. Google has also recently added similar features that allow a “trusted contact” to have access to your account should it become “inactive”. It is commonplace for solicitors to store a “letter of wishes” along with your will when you deposit it with them. This would normally contain wishes, that are not legally binding, for your funeral service and so on. I recently made a new will and asked my solicitor to store with it a letter of wishes listing my digital assets that I felt were of financial or sentimental value. Furthermore, my solicitors have said they are willing for me to give them updated lists on an annual basis. You can download the forms I used and modify them for your own use. I have put in some fictional details for an Arthur and Rosemary Munroe as examples of what you might include. If you have suggestions as to how I might modify the forms please leave a comment. There are actually two forms “Annually updated letter of wishes: financial assets” and “Annually updated letter of wishes: social digital legacy”. For the financial form I suggest that you do not include passwords on the electronic form in case your computer is hacked. A solicitor armed with your will and a death certificate should be able to access the accounts just using the account number. If you want to record passwords for your beneficiaries the safest thing is to printout the form and write in the relevant details with a pen before you give it to the solicitor.